The eyelet curtains' heading has metal rings sewn into the fabric, creating holes through which the curtain pole goes. The eyelets create fluted columns of fabric that give a lovely sculptured look to plain fabrics or finish patterned fabrics beautifully. 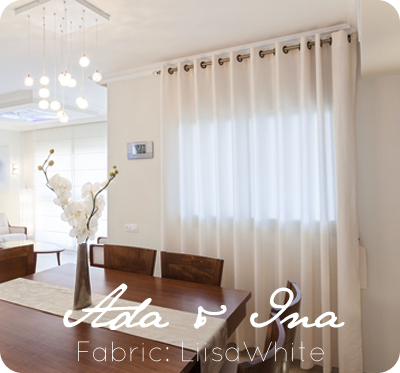 From Ada & Ina's online store you can order made to measure curtains with an eyelet heading. In the order form, after choosing fabric, there are a variety of curtain headings to choose from. You can choose from the following eyelet colours: Satin Nickel, Chrome, Matt Black, Brass, Antique Brass, Antique Nickel and Antique Copper. How do I hang eyelet curtains? Eyelet curtains are easy to hang - they are simply treaded onto a curtain pole. The fullness ratio for eyelet curtains is 1.35 (more fabric than the length of the pole is needed for the curtains to hang in fluted columns).